"It isn't about winning. It's about having the most fun." EJR entered off-road racing in 1994, and went on to compete for the next decade. Between those bookend years, the EJR crew may have had more fun than any team in the trackless deserts they raced on. They were a ragtag bunch—and proud of it. Competing was important (EJR always strove to win), but camaraderie was king. Despite EJR's intermittent participation in each year's race season, the team was able to bring home two firsts, several seconds, a third, several fifths, one sixth, one twelfth, and—in the interest of full disclosure—more DNFs than they care to remember. EJR officially began in 1994, racing mainly in Baja and Nevada. With few exceptions, Rich Hoffman drove and Thad Hutton navigated. The team's first vehicle was a Class One buggy. 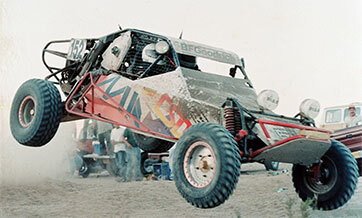 Although prone to DNFs, the buggy managed to carry them to a first-place finish in the 1997 Baja 1000. In 1999, after one-too-many buggy breakdowns, EJR moved up to a Protruck and participated in several races the following year. 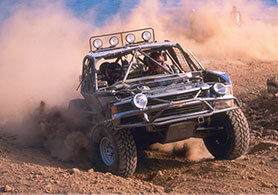 EJR's most successful Protruck race came with a win in the 2001 Baja 500. EJR continued to race until 2004. Unfortunately, the last event ended with a blown engine just seven miles into the race. Although the Protruck is gone, the friendships remain and the memories linger.